Dress: Courtesy of Urban Outfitters. Shirt: American Apparel. Loafers: TopShop. Bag: Balenciaga. Sunglasses: Rayban. Nails: 'lemon' from Barry M.
My absolute favorite thing about these pictures is the lady with the blue nails who's looking at the camera like "WTF!?!?". Hilarious! I went Bikini shopping in Oxford Circus today. I adored all the ones in my earlier post but they were all £100 and up. A little too much for scraps of material right? Anyway I found a very cute one in River Island that I'm in love with. 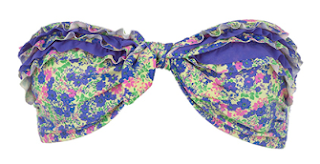 I think the frills add a flirty vibe and the print feels vintage. I'm very happy :) If any of you fancy one of these get the size up, the bikini pants are so tiny! They almost showed my whole bum! There was some great stuff in River Island today... For those of you that don't already know, River Island have done a Miu Miu 'inspired' shoe... They come in both navy blue and pink. I didn't buy a pair but I've done all the research for you. They are obviously not as gorgeous and lovely as the Miu Miu ones but I think if you want a little fashion fix then for £50 they're great.